When we think of the most common causes of kidney failure, usually we think of hypertension and diabetes. The prevalence of hypertension and diabetes in US is approximately 30% and 10%, respectively, and there is no question about the economical and individual burden of these chronic diseases. But what about rare diseases? There have been comments made that because they are rare and thereby by definition affect less people, that we should not focus our efforts on improving diagnostics, treatment options, or clinical care practice for these diseases. What some people may forget, is that even rare diseases affect our communities, and investing resources into understanding these diseases also informs us about other pathways that may also be dysfunctional in more common diseases. The classical example is Sickle Cell Disease. The National Organization for Rare Diseases and the NIH put sickle cell disease in the category of rare blood disorder. But if we look at the same disease from a little bit different angle we will see that it is actually the most common genetic blood disorder in US, the prevalence is significantly rising and due to the increased average lifespan in these patients. The average health care cost reaches almost 1 million dollars per patient (which makes the cost of the health care for sickle cell patients in the US exceeding 1.1 billion dollars annually). Moreover, currently there are only 2 clinically approved drugs for the treatment of sickle cell disease, and neither of them target sickle cell associated renal complications. That really underscores the urgent need for the development of new therapeutic therapies for chronic complications of this “rare” disease. Sickle cell disease is caused by single mutation in the hemoglobin gene that results in hemoglobin polymerization, erythrocyte sickling, endothelial activation and vaso-occlusion that subsequently leads to chronic tissue hypoxia and organ damage. Sickle cell nephropathy is the second leading cause of death and at the average age of 23 approximately 20% of sickle cell patients are diagnosed with end-stage renal disease (ESRD). Sickle cell patients with ESRD have a very high mortality rate, with most surviving less than 3 years after the diagnosis. This level of disease burden occurs due to unknown mechanisms that underlie sickle cell nephropathy. In other words, if we can figure out why and how the pathophysiological processes work within the sickle kidney we will be able to block or prevent it disease progression. So now the question is how can we do that? The answer is very simple; if we want to unravel and better understand the unknown mechanisms we need to start from basics. Basic science gives us this great ability to test potential injury mediated mechanisms in a setting of the disease. Lets think about the disease setting for a second from a basic science perspective. We know that central characteristics of the sickle cell disease milieu include hypoxia, oxidative stress, or even thrombosis. These same processes are established inducers of endothelin-1 (ET), a signaling peptide produced by diverse cell types that exerts its physiologic and pathophysiologic actions by binding to two receptor subtypes, ETA and ETB. Elevated endothelin-1 has been demonstrated in sickle cell disease patients. Moreover, in the kidney, endothelin-1 has been widely implicated as a mechanistic contributor to the development of various forms of CKD. Therefore we accepted the challenge to elucidate the mechanisms of sickle cell associated kidney injury and designed the study investigating the renal protective potential of endothelin receptor antagonism in the treatment of sickle nephropathy. We utilized a mouse sickle cell disease model, which is characterized by knocked-out mouse globin genes and knocked-in correct and mutant human globin genes. This mouse develops full-blown sickle cell nephropathy (by 12 weeks of age). Sickle cell and control mice were treated with selective ETA receptor antagonist or dual ETA and ETB receptor antagonist starting at the time of weaning (when they can live without mom) and continued for 10 months and at the end of the study kidney structure and function were assessed. Our results demonstrated reno-protective effect of selective ETA receptor blockade evidenced by preserved GFR, prevention of proteinuria, and protection of tubular structure and function. Dual ETA and ETB receptor antagonism provided only some of the protection observed with selective ETA receptor antagonist, highlighting the importance of exclusively targeting the ETA receptor in sickle cell disease associated nephropathy. In conclusion our study is one out of many examples representing the beauty of the translational character of basic research and the great potential that may benefit million of patients with “rare” disease. 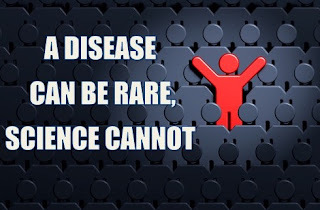 We should strive to understand the mechanisms of disease and thereby try to prevent disease (or reduced disease progression), improve diagnostic tools, therapeutic interventions, and clinical care for all people, regardless if this is a “rare” or “common” in our society.